Virtual Reality is the next big thing in technology industry. All the technology giants are focusing on this new segment. However, this all started long back in 1950s when first idea of a virtual reality headset appeared in a science fiction and since then it has grown tremendously. No matter if it’s Google, Samsung, Oculus or any other manufacturer; all are trying to figure out a way to improve Virtual Reality technology. OnePlus has now also joined the chunk of Virtual Reality headsets but not in Samsung or Oculus’s style. Google’s first attempt to make a cheap Virtual Reality headset gave birth to Google Cardboard. Google Cardboard gained popularity because of its cheaper price, the material used (i.e. cardboard) and the kind of experience it delivered in a pocket friendly manner. OnePlus has also followed the similar path and developed OnePlus Virtual Reality Headset. According to OnePlus, they have used much better material for their headset which makes it durable not disposable. Also, company claims that they have reduced the size of VR headset by 20% without compromising with the VR experience. At last, company says that have used special coating on the headset to make it dust resistant as well. OnePlus’s interest in Virtual Reality can be seen from their recent announcement. Company has announced that they will be unveiling their new flagship device i.e. 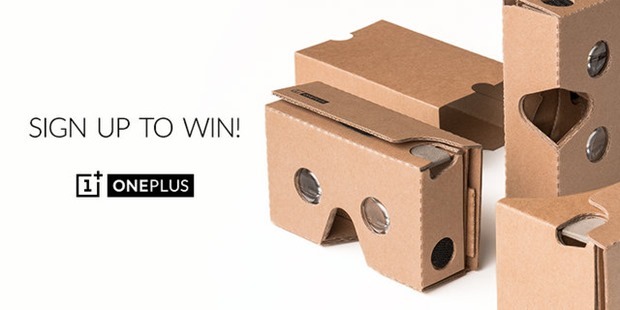 OnePlus Two in Virtual Reality. The product will be launched on 27th of July 2015 and streaming of the event will be open to all across the world. So, this gives a very clear signal that OnePlus is dedicated towards encouraging the Virtual Reality technology through its products. OnePlus Virtual Reality Headset will be available for Rs. 99 in India and concerned people will be able to purchase it via Amazon. As per the company’s blog the VR headset will go on sale in India starting from the third week of July 2015. If we talk about the difference between Google Cardboard and OnePlus Virtual Reality headset, there are some minute differences that we know so far. As we have already mentioned that OnePlus’s VR headset will be smaller in size which is a great thing. Apart from this OnePlus has also focused on increasing the durability of the product. While, Google Cardboard will cost you more bucks, OnePlus VR Headset is as pocket friendly as it can get. Paytm To Penetrate Fast Growing Online Travel Market Space, Will Follow Alitrip Model. Thanks for post OnePlus VR Headset , Looking for long time on this. Kindly confirm the date of launch in India if possible. Thanks for the information. OnePlus has always been aggressive regarding the price in India and it’s a steal deal. Will be buying one. Nice article though.